This is the most exciting tour to North Korea in 2018! Witness North Korea’s most famous highlights: We will charter a flight to the remote supervolcano of Mt. Paektu and be in Pyongyang for the special 70th Anniversary National Day festivities, likely to include a military parade! Mt. Paektu is the most sacred and beautiful location in North Korea, reachable only by charter flight making it an ultra-exclusive destination. 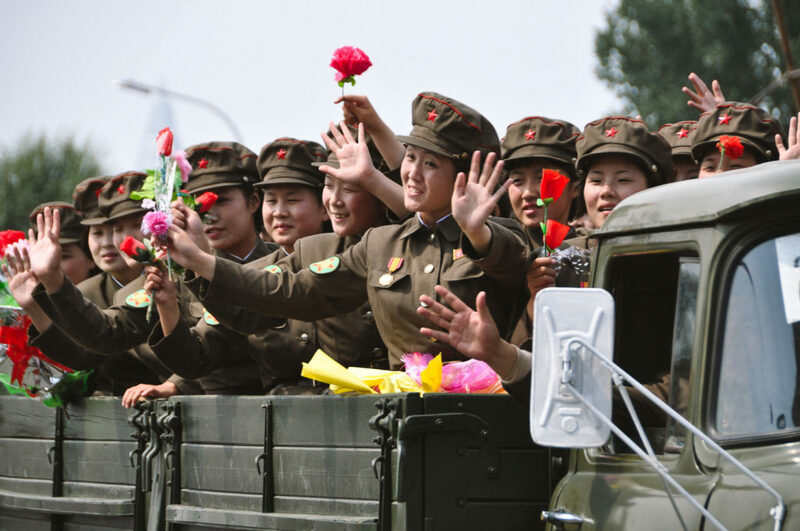 Military parades occur infrequently in the DPRK and major anniversaries are historically the most likely to include such an event. We will explore Pyongyang, the capital city of North Korea with a visit to all of the iconic monuments such as the Tower of Juche Idea, take a ride on the Pyongyang metro and a look into the newly renovated Fatherland Liberation War Museum alongside the USS Pueblo. Enjoy a day-trip to witness each Korea face off at the DMZ! This is an incredibly rare opportunity to see it all. Book early to avoid disappointment! Note: National holiday festivities in North Korea are not confirmed by authorities until the weeks or days prior, or even until the day of. As such, although it is expected, we cannot guarantee a military parade on National Day. At approximately 10am, meet us in Terminal 2 of Beijing Capital International Airport (PEK) to check in for our flight on North Korea’s flagship airline, Air Koryo departing at 1pm. Meet the group and we will hand out your DPRK visas! Fly to Pyongyang, the capital of the DPRK and home to many of the most iconic monuments and political sites. Our Korean guides will be meet us with a warm welcome at the airport. En route to the hotel, our guides will point out the Fatherland Liberation War Martyrs Cemetery with its striking monument of a bayonet before we stop at the Arch of Triumph, the world’s largest triumphal arch. From the top, we will get our first panorama view of Pyongyang city! 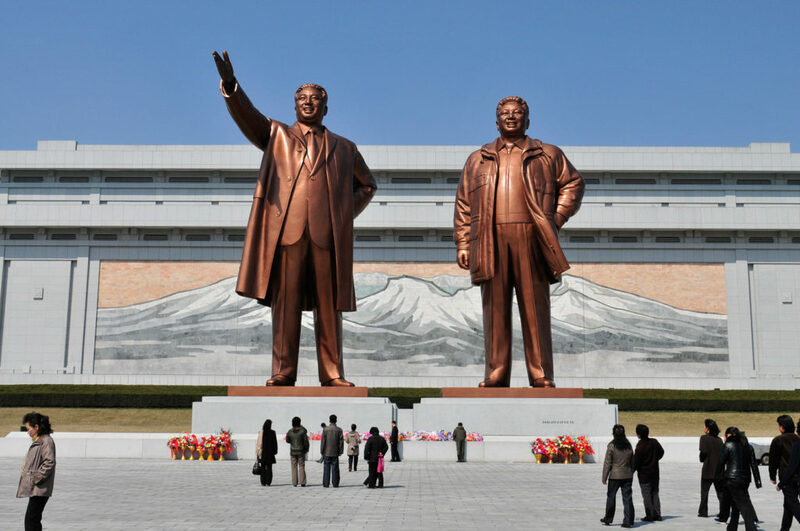 Then head over to the Mansudae Grand Monument, an important site famous for its large, bronze statues of President Kim Il Sung and Chairman Kim Jong Il. It is customary to bow and lay flowers here. Then visit the Mansudae Fountain Park, a serene meeting spot for students and an often used backdrop for wedding photos. Check into the Koryo Hotel, our deluxe accommodation in the heart of Pyongyang popular with local residents, foreign diplomats, delegations, NGOs. Our welcome dinner will be in style at the Koryo Hotel’s top floor revolving restaurant! In the morning, we will drive to Pyongyang Sunan International Airport where we’ll take our 8:00am Air Koryo charter flight on a 40-seater Antonov AN-24 to the remote Samjiyon Airport (1.5 hours). 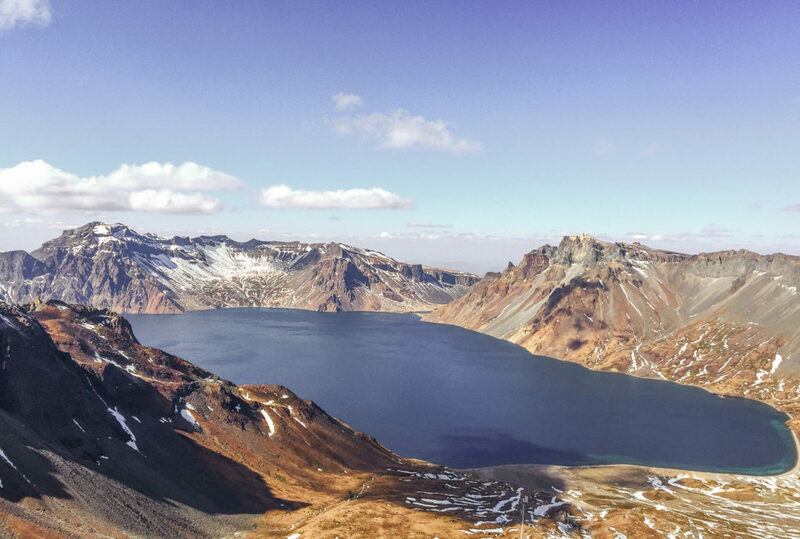 From there, we travel to Mount Paekdu, the tallest peak in all of Korea which doubles as a supervolcano that’s said to be Charman Kim Jong-Il’s birthplace. Mount Paekdu was formed by volcanic eruption towards the third period of the Cenozoic Era and the crater Lake Chon in the center is one of the deepest (and surely most beautiful!) mountain lakes in the world. The mountain is sacred in both North and South Korea and beyond Chairman Kim Jong-Il’s birthplace, it’s regarded as the origin point of the first Korean kingdom. Upon arrival, visit and oversee the majestic Lake Chon, which measures about 384 meters in depth. We’ll then have a high-altitude picnic lunch before hiking to the Paektusan Secret Camp that once held the headquarters of the Korean People’s Revolutionary Army and which contains Chairman Kim Jong-Il’s Native Home, said to be his exact birthplace. We will see some preserved items from his early years, Jong-Il Peak and other odes to the camps revolutionary history such as monuments and famous slogan trees. Afterwards, we will visit Samjiyon Schoolchildren’s Palace, an extra-curricular facility for children to learn performance arts and sports. Enjoy a special dinner before we check-in for overnight at the Pegaebong Hotel in Samjiyon Town. Start the day with a visit to the powerful Rimyongsu Waterfall created from the waters of Lake Chon flowing out from the ground-water zone and through the cliff. We will then visit Chongbong Secret Camp, where military guides will tell us about this revolutionary site once occupied by Anti-Japanese guerillas. Lunch will be back in Samjiyon town. After lunch, we will get the best view over Samijyon County from atop the Samjiyon Ski Resort. Then visit the Samjiyon Grand Monument, a massive bronze monument of a young Kim Il-Sung. This is the second-largest monument to Kim Il-Sung in North Korea and the complex is home to many other large and intricate monuments with backdrops of both Lake Samji and Mt. Paektu! Afterwards, we will head back to Samjiyon Airport for our 18:00 charter flight back to Pyongyang. Take an optional visit to the Kaeson Youth Amusement Park where the thrillseekers among us can brave the rides with Pyongyang locals on a night out. Dinner and overnight will be at the Koryo Hotel. DAY 4 – NATIONAL DAY – 70TH ANNIVERSARY! As a military parade and other major celebrations are expected for the 70th Anniversary of National Day, today’s activities are subject to change. Be assured that we’ll be on-location for the major available festivities! We will start the morning off with a visit to the Kumsusan Palace of the Sun, the grand mausoleum where the late leaders lie in state. Afterward, take a walk in Kim Il Sung Square, the 3rd largest public square in the world and home to many of the North Korean military parades broadcast internationally during important holiday events. Take a stroll through the city to the Foreign Languages Bookshop which provides the best chance in the DPRK to pick up postcards, publications, posters and other trinkets that make perfect souvenirs. Visit the Grand People’s Study House, an extensive library used to further education and the heart of study on the national Juche ideology. After lunch, we will go walking on Moran Hill, a park place buzzing with festivities as locals celebrate the National Day with picnics and dancing! 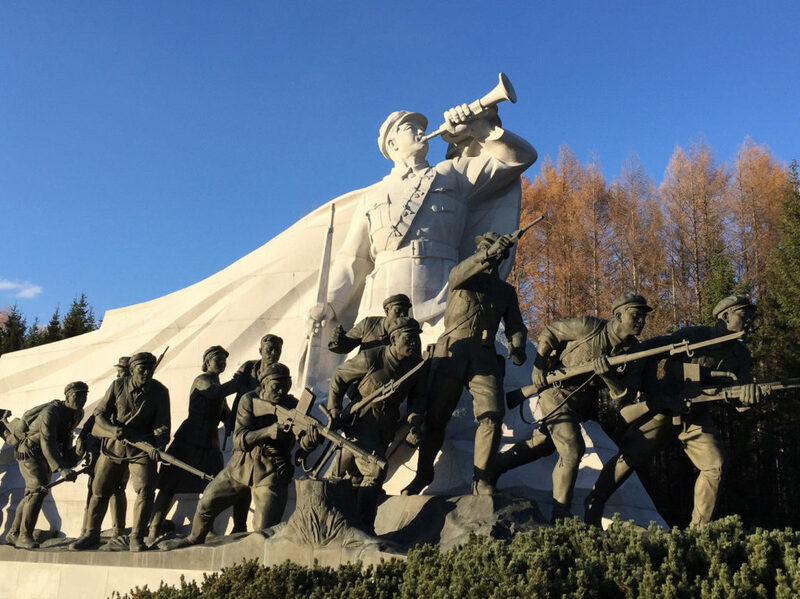 Learn about the DPRK’s defining ideology, the Juche philosophy, on a visit to the iconic Tower of Juche Idea for the best views in Pyongyang city! Then visit the massive Monument to Party Founding, built to commemorate the 50th anniversary of the foundation of the Workers’ Party of Korea. Afterward, we’ll witness (and take part in!) National Day festivities, usually including an unforgettable mass dance event in Kim Il-Sung Square where you can join in if you wish, but could include a military parade. For lunch, enjoy Pansanggi, a historic Kaesong cuisine traditionally served for royalty. Afterwards, stop at the original Sonjuk Bridge, a UNESCO site. On our return to Pyongyang, we will visit the newly renovated Victorious Fatherland Liberation War Museum and the USS Pueblo in its new spot (the “American Spy Ship” captured in 1968). We will then attend the Mass Games, an extraordinary event involving up to 100,000 people performing in unison through dance and gymnastics to pay homage to North Korea’s culture and history. For dinner, enjoy Korean bibimbap and get the chance to taste local Korean draft beers at the Taedonggang Microbrewery. Take an early morning departure to Beijing. Estimated time of arrival in Beijing is 10:00 a.m. local time. Please reserve any connecting flights departing after 1:30pm local time to allow sufficient time for immigration/customs clearance, baggage claim, re-check-in, and security.